Don't face interviews, appointments and assessments alone: your right to be accompanied to interviews at the jobcentre and all DWP offices has been confirmed by the DWP. This has been confirmed in writing many times by the DWP and by Jobcentre managers. Edinburgh Coalition Against Poverty and the Scottish Unemployed Workers’ Network have excellent resources about your right to be accompanied, which can be found here (ECAP) and here (SWUN). You can view a template letter informing Jobcentre staff you will be accompanied at your appointment on the Refuted website here. 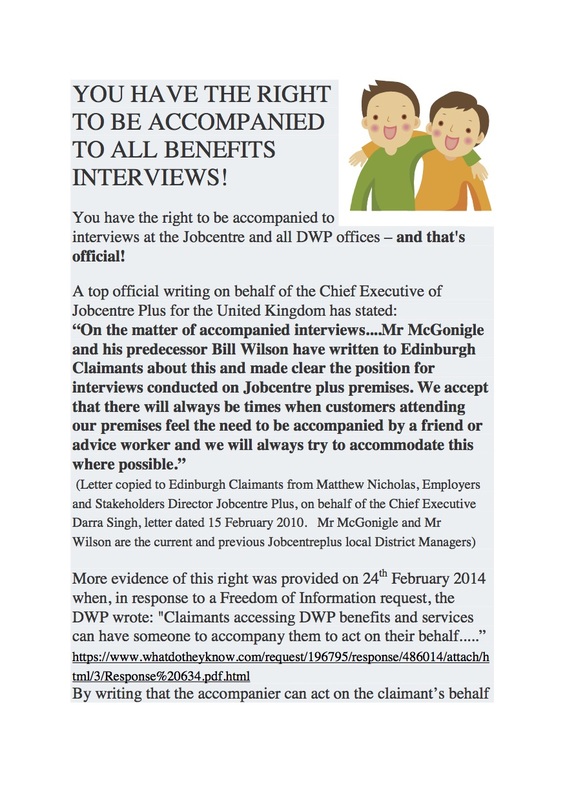 Edinburgh Coalition Against Poverty have confirmed that this applies to interviews on the premises of workfare providers like Urban Futures and Learndirect as well as at the Jobcentre.